Among the parents I most admire are some atheist couples. In them, I’ve observed a sustained and intentional engagement with cultivating a worldview for their children that reflects their family’s core values. Some of these values include curiosity, a rigorous search for truth, quality education for all, care and justice for the oppressed, choice, wonder, and awe. These are all values I share and hope to cultivate in my own family. But where I draw upon my Christian faith and a shared religious tradition to deepen these values, my atheist friends choose other ways to shape their families’ worlds. Some use scientific methods to explore and explain these values. Some use debate or conversation to draw out these values. Sometimes, my atheist friends simply marvel at the amazing things their kids do – and they are amazing. Jill and Linda and their respective spouses in particular are raising children whose eyes and hearts are on justice and equality, whose minds and hearts are wide-open, and who are some of the most morally centered kids I’ve ever known. Jill’s tween daughter has been a self-identified feminist for years, and asked to attend Pride last year so she could stand in solidarity with her LGBT friends of all ages. Linda’s tween son uses his considerable social influence to welcome and include students who have been bullied in the past, and to call his other “popular” friends to account when they act meanly. Both of these young people stand up and act up in deeply compassionate ways. They are already shaping the communities of which they are a part in powerfully positive ways. These families inspire and challenge me every day to be thoughtful and intentional in sharing my own values as I parent my daughter, so that she may develop the kinds of values these young people embody. My college roommate Madha and her spouse Tom are another example of inspiring, intentional, thoughtful parents who don’t actively practice religion. Their stories are theirs to share, but it is enough to say that one was profoundly influenced by Catholic social teaching. One calls oneself an atheist, while the other expresses more complicated views. Both are in helping professions. Both are deeply, profoundly feminist to their core. Both model a gentle, thoughtful parenting style that on my best days I imagine I can mimic only in the most meager way. Both are incredibly serious and incredibly fun, and they are raising two absolutely delightful young children. Tom and I in particular tend to spar on many topics. Tom is always respectful and kind, but he’s tough. He doesn’t let stuff go, and he plays out the implications of various scenarios. When I think of Tom, I often think of the verse from Proverbs that reads, “Faithful are the wounds of a friend,” because Tom’s words are often rough like sandpaper against my spirit. But they serve the same function as sandpaper does: to smooth and polish my beliefs and values until I can see them more clearly and act on them more faithfully. Our conversations rub at me, worrying away until I’m more attentive. Last summer we got on the conversation of ritual, and what’s worth marking ritually in the lives of our children. Tom believes that ritual is really valuable, and that for it to mean anything, ritual should be reserved for significant situations – and the ritual itself should make sense to what’s being marked. I share these views, but I hadn’t applied them in the same ways he proposed. What are the things worth making a “big deal” over? High school graduation? One’s first sexual encounter? What about getting our child’s ears pierced, or nails polished? This last topic is of particular interest to our families, and to the moms in them, both of whom enjoy earrings and the occasional manicure. Both of our families have young children, past the stage in infancy where some parents would choose piercing for the child, but not yet at the age where they can reliably care for the responsibility that comes with freshly pierced ears. So our question becomes: if and when to do it, and how big a deal to make of it. Do we say, “When you are twelve, you can do this,” and then plan a big hoopla around that? Do we simply go do it one day, with no fanfare? Something in between? How do our cultural histories inform these choices? Among the concerns Tom raised about making a ritual out of ear piercing were feminist issues. “What does that say about what we really value, if we’ve been telling our daughter that what matters is her mind and her brain and her intelligence, but then we make this big to-do about getting sparkly, pretty things in her ears?” (I’m paraphrasing here.) That caught me up. What does our ritualizing of certain elements of our life say about the things we truly value? 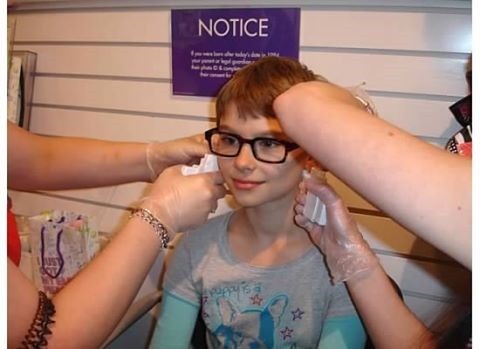 Will making a big deal out of getting one’s ears pierced prevent a child from becoming a feminist who cares about the education and advancement of women? Probably not. But this question continues to grind away at me. If we want to make a big deal of it, or plan a big celebration on our child’s twelfth birthday that will culminate in a trip to the mall, why are we doing so? Do we have a happy memory of doing this with our parents? Are we honoring our child’s bodily autonomy and responsibility for self-care and self-presentation? Is it because we are tired of saying “no” to the request? Ritual matters. By whatever motivation or wellspring we draw upon in shaping the rituals of our family – they matter in shaping our children’s worldviews. No matter the source of those worldviews or our rituals, I know that I want to be as intentional about marking the things that matter as my atheist friends do. Tags: children, family, family values, kids, parenting, ritual. Bookmark the permalink.